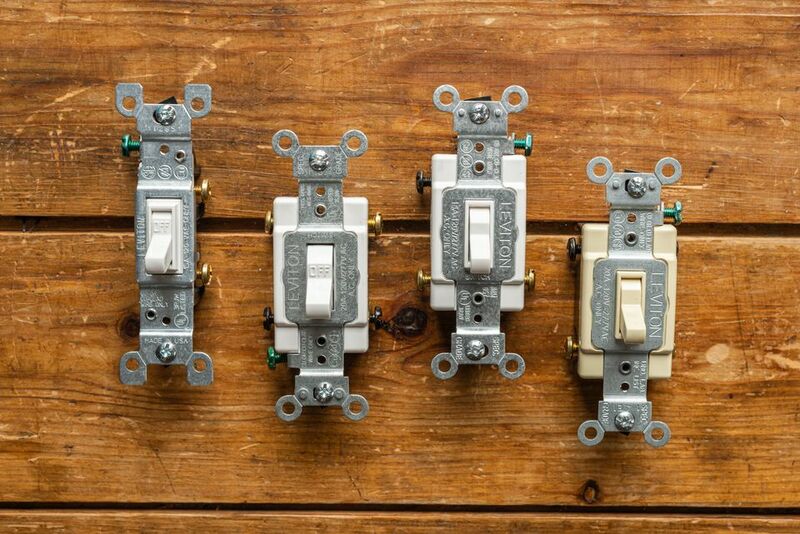 The wall switch is one of the most common and important electrical devices in the home. There are several different types of switches, and although they may look the same when they are installed with their faceplates intact, the various switches look and function differently on the inside. Most of the common types of switches come in different styles, such as toggle, rocker, slider, or push-button. The style usually does not affect the switch function and wiring. While switches usually are used for lights, they can be used to turn electrical current on or off for nearly any electrical device. For example, switches sometimes are installed to control the current running to an outlet in order to turn a floor lamp on or off. The single-pole switch is the general-purpose workhorse of switches. It is used to control a light, receptacle, or other device from a single location. A characteristic feature of a single-pole toggle switch is that it has on and off markings on the toggle. This is something you will not find on three-way or four-way switches. However, some styles of single-pole switches (notably, rocker style switches) do not have on/off markings. A single-pole switch has two brass-colored screw terminals that are connected to the hot, or power-source, wires. These wires are usually black. One brass terminal is designated for the incoming hot wire from the power source, and the other is for the outgoing hot wire to the fixture. Most single-pole switches also include a ground terminal for connecting the circuit's ground wire. As a general rule, neutral (usually white) wires are not connected to switches. If two neutrals are present in the box, these wires typically are joined so that they continue through the box without touching the switch. Or, you may see a single neutral wire passing through the box. Sometimes, however, you may see a white wire attached to the switch, and this is when it is functioning as a hot wire. In this case, the white wire should have a wrap of black tape on it near the switch terminal to indicate that the wire is operating as a hot wire and not a neutral wire. Three-way switches are always used in pairs and allow you to control a light or receptacle from two different locations. These switches have no on/off markings because the on and off positions will vary as the switches are used. The three-way switch has three terminal screws. The hot wire from the power source connects to the darkest screw terminal marked "COM" for "common." The other two terminals are called travelers and are interchangeable. For purposes of safety, it is important to remember that travelers are always hot wires. The switch also has a ground screw. The trick in replacing an old three-way switch is to mark the wire attached to the COM terminal before you remove the old switch. Since the other two terminals are interchangeable, it is impossible to get them wrong; they can go either way. If there is a white wire connected to a traveler terminal, it should be labeled with black tape to indicate it is hot. Three-way switches are usually found at both ends of a staircase, in garages or basements that have two entries, in hallways, and other places where two separate switches control one light. The double-pole switch is commonly used in industrial applications but can be found in some home wiring systems. Like the single-pole switch, a double-pole switch has on/off markings and controls a device or equipment from one location. The main difference is that a double-pole switch has four hot brass terminals, instead of two, plus a ground terminal. This allows the user to connect it to two pairs of hot wires from a 240-volt circuit. Double-pole switches are commonly rated for 30 amps, compared to 15 or 20 amps with standard switches. This allows the switches to control power feeding higher-demand appliances, motors, and machinery. The four-way switch is used between two three-way switches to provide control for an outlet or light fixture from three or more different locations. If you want to have control from more than three locations—for example, five locations—you would still use two three-way switches (one on each end) and three four-way switches between the two three-ways. The four-way switch looks similar to a double-pole switch, except it has no on/off markings. It has four terminals plus a ground terminal. The four terminals are usually brass-colored. There is no "COM" or "common" terminal, as is found on a three-way switch. The four-way switch functions as a switching device for the traveler wires between the three-way switches. While not commonly used, four-way switches are sometimes found in long hallways and in very large rooms that have more than two entrances.